If the State Corporation Commission holds a hearing and Bacon’s Rebellion is not there to cover it, does it make news? Well it turns out there is a transcript. Having first held a hearing to debate whether it had the authority to reject a two-turbine, $300 million off-shore wind “demonstration” facility blessed by the General Assembly, the SCC turned to the project details in three days of hearings October 9-11. A flurry of additional written testimony and exhibits have also been added to the record, even though no participant in the discussion is arguing the SCC should say no. With the remnants of Hurricane Michael bearing down on Virginia, but not from the direction of the Atlantic Coast, Dominion Virginia Energy bolstered its arguments that what it will learn from this project is worth the cost of the electricity to ratepayers – about 77 cents per kilowatt hour — which on its face is more than 10 times the cost of power from the Vineyard Wind project going forward off Massachusetts. Some new information on cost comparisons is now on the record. “I mean, I wouldn’t spend my money if that’s what you’re asking. I would not,” replied Scott Norwood, who testifies often and is usually a watchdog on behalf of consumers. It was as a demonstration project that the 2018 General Assembly deemed the project as being in the public interest, a tiny piece of its giant regulation package. The 12-megawatt project is a precursor to a larger wind field, perhaps as vast as 2,000 megawatts, planned for the same location. An exhibit cited the utility’s current integrated resource plan estimate that power coming from the big project will cost about 13 cents per kilowatt hour. “Staff’s concerns set out in the prefiled testimony and in my opening statement have not been diminished during the hearing,” said SCC staff attorney Kiva Pierce in closing. “This is a risky project made riskier by a design change, and ratepayers bear almost all of the risk. And as has been noted now multiple times, prudency is all about risk. While there is a warranty, it is a limited warranty, and it does not cover waves or category three hurricane conditions. “If the Company does not wait and gather data from the project before making a decision on a larger-scale generation project, then in Staff’s mind it is questionable if this is a demonstration project,” Pierce said. Given the maturity of offshore wind technology world wide, there isn’t much more to demonstrate beyond seeing what happens when a hurricane shows up, which may never happen. The SCC staff and the Attorney General’s Office are arguing for some restraints on the project, including a cap on the cost. But they are not asking the Commission to spike it entirely. Even so, a Dominion Energy lawyer tried to impeach Attorney General’s witness Norwood by introducing a news article from 2015 in which Attorney General Mark Herring heaped praise on an earlier and more expensive version of this project. “I’ll object,” said Assistant Attorney General Meade Browder. “Your Honor. This statement is from sometime in 2015. We’re here now in 2018. Mr. Burton and I are not here doing our own thing solo. We’re here on behalf of the office who is led by Attorney General Mark Herring. I don’t believe it’s an appropriate question.” The objection was sustained, but the point was made – the politicians including their boss bought into this early with no thought to the consumer cost. Details of the cost remain murky, because at Dominion’s request much information remains confidential. The full cost of the 27-mile transmission line is not being shared, for example. The record is replete with redaction. An SCC accountant estimated the 25-year all-in (including finance costs and profit) revenue requirement for the project at $694 million, which would be highly relevant if this were funded the same way as other new generation and which may still be what Dominion charges its customers over time. All of the accounting will be decided in a future case looking back at costs. As the case goes on, the record is filling up with testimonials from politicians and business groups, most of them arguing that this project will make Virginia the center of a burgeoning offshore wind industry on the Atlantic coast. That drew some skepticism from Chairman Christie, as well. “Well, every project on the East Coast, Vineyard, Block Island, every one of them uses the same argument, we need to do this because we’ll become the East Coast hub. Why is this one going to become the East Coast hub when the others are not, or will everybody be an East Coast hub?” Christie asked. The possible larger project creates an entirely different economic scenario, with far better economies of scale, and if Dominion proceeds the argument over it will include whether all the power is needed as demand flattens. But a review of this hearing record and the pile of new documents does not dissuade me from my earlier opinion that this little boondoggle is unreasonable, imprudent, and only demonstrates the disasters that ensue when the political class disregards the consumers and overrides the autonomy of the SCC. Good scoop, Steve. Valuable summary of the issue. Regarding your conclusion that the test turbines are a boondoggle…. If the SCC nixes the test turbines, that effectively nixes the off-shore wind field, right? Surely, you wouldn’t support building a whole field of offshore turbines without some evidence that they could stand up to South Atlantic hurricane conditions. Are you willing to say “no” to offshore wind entirely? Until or unless a big storm actually hits the two turbines, nobody will learn anything. So Dominion will be deciding on the larger project knowing exactly what it knows today. No, I’m not saying no to the larger project out of hand. But it would be nice if somebody else besides D ratepayers shared the risk. 1. Putting hurricanes off to the side a moment, do windmill farms off Virginia have any significant known advantages and/or disadvantages over windmill farms proposed in other “competitive locations?” Would any such advantages or disadvantages alter “normal” risks profiles on the Va. projects feasibility? In any set of circumstances, would not Dominion do a pilot program first if only to bring itself up to speed skill wise and to test for unknown risks, so as to counter those risks? How can it be true that there are no experiences worldwide for windmills of this sort in wind patterns and speeds comparable to Virginia coastal high wind patterns? Surely there must be some comparables somewhere, unless these particular windmills proposed for Va. must be or are structurally unique in some way, or never been put to such a test before? How easy or likely is it the a competitor location(s) likely possesses such known advantages or disadvantages that exceptions to normal rules such apply to Dominion going ahead with a pilot? If you take a look at a map of wind velocity, offshore wind off the Atlantic eastcoast “makes sense” due to relatively constant, high speed winds. But that is offset by the fact that offshore wind power is very expensive compared to onshore wind. So to answer your question, it might make more sense for Dominion/Virginia to invest in onshore wind in the PA/MD/WV wind corridor in the Appalacians. Unfort for us, that mountain wind resource does not extend into our state boundaries, but that does not mean we could not invest there. To me the interest in offshore wind for Virginia is a little bit of economic hot dogging for a mega-project. Hamption Roads is excited about the potential for a job-creating wind energy business from the shipping ports, and Dominion is excited if they can build an expensive project and the rate payers have to foot the costs. Seems like they ought to get the US Dept of Interior on board to share risk, and other players. Recent news – “I’m very bullish on offshore wind, and harnessing this renewable resource is a big part of the Trump administration’s made in America energy strategy,” Zinke said in a statement. Then I think some questions would come up, like I wonder a test has to be 25-miles out? And other design considerations. I think originally Dominion was ambivalent about offshore wind and if I recall the DOI grants expired. 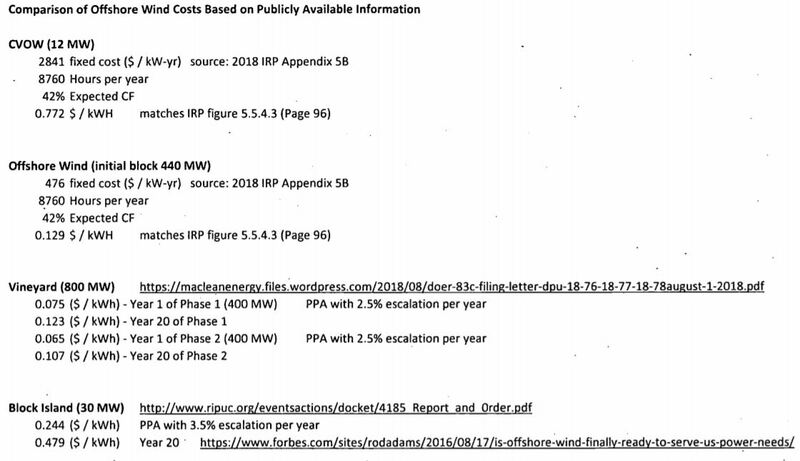 But I’m not surprised Dominion prefers to redact as much as they can about it now to not let potential competitors a foothold which is fairly consistent with the way they conduct themselves on other renewables. Offshore wind apparently requires a huge up-front investment and to date even in Europe, those turbines are not 100% private sector. But apples to apples – we’d not have a single Nuclear plant in this country if it were not for govt subsidies and incentives. Oh, there are major subsidies, tax credits, RECs to sell, etc. None of those if tapped will benefit Dominion ratepayers. THAT is what the company may be wishing to hide. Dominion is all for this now because with the new ways it has to shove costs off on ratepayers under this new statute, there really is zero risk to it stockholders. Remember in my earlier post one of the items covered up with black ink was a risk assessment Dominion prepared for its own board. Obviously there is a great deal that I do not know about this business. But in general what you describe appears on its face to be gross distortion of the norm, namely, that the customers of a business do not take the risk of a business’s loses because customers get no profit upside. Hence, instead, the shareholders of a business get the upside profit in return for taking the risk of losses incurred by the business wherein their shareholder interests reside. If Dominion has turned this simple rule on its head, and is using ratepayers as a shield to absorb losses to order to protect Dominion shareholders’ against losses that they otherwise would absorb, than a lawsuit should be filed against Dominion. I suspect the Dominion’s defense likely would rest on the legal insulation provided by their separate for profit company. But at what point does that become a distinction without a difference, given how Dominion is operated? The problem is not Dominion. The General Assembly is responsible for the erosion of the normal relationships between utility, regulator and customer. Dominion has encouraged and benefited, but the legislators should have known better. And in this case, in fairness, the language of the bill did not fully dictate an outcome. The SCC is being asked if the project is prudent and still might say it is not. There are other places in the 2018 bill where the SCC was totally hogtied. As to a lawsuit, the Virginia Supreme Court has interpreted the state Constitution to give the General Assembly all but total control. I hadn’t really thought about a federal claim but the real solution is at the ballot box. re: “… The SCC is being asked if the project is prudent … ” for ratepayers? Yes, Reed, Dominion does have a “separate for profit company” for its unregulated generation business elsewhere in the Country. But in Virginia the Commission allows it to continue to build regulated generation and place the investment cost in its rate base and include the net operating expense in its retail rates. This shifts the entire risk of early obsolescence and “stranded cost” onto the customers, not the shareholders. So, of course, Dominion does not place its new generation for Virginia customers in its unregulated subsidiary, but in its regulated utility, the corporation still officially named Virginia Electric and Power Company. Rate-basing is such a sweet, riskless deal in today’s world that they’d be fools to do otherwise. Even so, rate-basing comes with the requirement that the Commission find up-front that the new generation is “in the public interest” and “convenient and necessary” and that the resulting rates are “just and reasonable” — legal requirements with years of interpretation and precedent behind them — but now, the GA has more-or-less decreed in advance that this project is deemed in the public interest whatever the Commission thinks of it. As Steve says, “the problem is not Dominion.” The problem is the GA’s undermining of its own regulatory agency, a travesty allowed by the Supreme Court’s interpretation of the Virginia Constitution (holding that the GA can tell the Commission what to decide) — neither of which had to happen. We can try to blame Dominion’s lobbyists for the politics that has brought about this result — but that’s politics. Thank you for that wonderful clarification. It terrifically crystallizes one of the central corruptions within our society today, how the elites have captured the “peoples” government to gain private advantage for themselves at public expense. We see this now everywhere, from education (K-12 & higher ed.) to electricity generation to public election process, (gerrymandering, et. al.). And now on a parallel course, I suggest that we can ever more clearly see the growing reaction to the elite’s usurpation of the people’s government. Trump has masterfully tapped into this corruption. He uses it as if a boomerang to generate his own growing source of power and support, with all the potential risks and rewards that both trends entail. We are all in for a wild ride, a cultural shift of immense proportions, in ways yet to be known. The discussion about offshore wind is being framed incorrectly in Virginia. We have made it a “give Dominion approval for a 77 cents/kWh demonstration project – or we will be left behind” issue. Massachusetts has received bids for a fixed price offshore wind project that will produce electricity at a wholesale price of 7+ cents/kWh. Other developments along the east coast are expected to produce electricity in the 5-6 cents/kWh range, which is comparable to many onshore wind projects. All of the other states are requesting bids for fixed price Power Purchase Agreements. Most of these states have decoupled utility generation from the rate base so there is not the incentive for their utilities to push the risk on to the ratepayers the way it exists here in Virginia. The current proposals are a huge profit opportunity for the utilities at great expense to families and business customers. We can develop our wind resources at competitive prices here in Virginia, and develop a hub for offshore development for offshore wind without creating an expensive project that must be funded by ratepayers. Let the private developer be responsible for the risk. They will sign a contract to provide power at a competitive price, so they must be confident that they can produce the energy reliably at the agreed upon price. There is no benefit to Virginians by undertaking this project via the regulated utility. The risk will be ours at a much higher price. The only advantage will accrue to the utility shareholders. Taxpayer subsidies might be required to develop the “hub” but that would be the case no matter which organization develops the offshore wind farm. Let’s broaden the discussion beyond the narrow set of choices that has limited the discussion thus far. That makes total sense to me. I can see no good reason whatsoever why ratepayers should be exposed to this enormous risk. On its face, it is plainly an abuse of the process, unless Dominion can clearly demonstrate otherwise. And why, given what Steve says, is the State Corporation Commission not being abused also by there process here? That is another question. What am I missing? Why is that wrong? You have characterized things correctly. The SCC is having to adjudicate the issue because Dominion has made an application for a project and the GA has said that the project is “in the public interest” without any detailed information to back that up. The SCC is being put into a bind. They must either decide to foist an extremely expensive energy project onto the ratepayers, that it appears will enrich the shareholders; or they must deny the project because it doesn’t make economic sense at the expense of angering the GA which appoints the Commissioners (they are missing one presently). Most states have institutions in place that aid in the development and implementation of energy policy. Most of that appears to be left up to the utilities in Virginia. With the rapid transformation of our energy sector that is underway, relying on outdated regulatory schemes could harm our energy companies and our economy. Yes, the larger project makes much more sense in many ways and declining demand would require Dominion to mske more choices about closures if they put up all the wind. … and I see Tom has put up my other issue as I compiled this … Why Dominion as developer/owner? According to the Department of Energy, the U.S. has a total project pipeline of 25,434 MW of offshore wind energy as of June 2018. This US pipeline includes 3,892 MW of project-specific capacity and 21,542 MW of undeveloped lease area potential capacity… Roughly 2,000 MW of new offshore wind capacity is expected to be operational by 2023. 70+ percent of the US population lives near a coast line. This is a resource we should develop. With larger turbines, built farther from shore to capture better resources, offshore wind power might beat everything except nuclear, “delivering capacity factors that exceed 60%”. In order to aid the start of the offshore wind industry the US did some environmental coastline regulation programs to define and simplify construction called Smart from the Start. Then a few years ago, seeing the offshore energy industry required accurate meteorological and oceanographic information to evaluate the energy potential, economic viability, and engineering requirements of offshore energy project site, DOE established USMODCORE. December 2015 marks the one-year anniversary of deploying a buoy off the coast of Virginia Beach, in support of Dominion Virginia Power’s Advanced Technology Demonstration Project. This year-long data set contains atmospheric, wind speed, wind direction, and wave measurements that play an important role in both wind farm design and in securing project financing. Sounds to me the info needed to build is already gathered, minimizing the risk of building a first windfarm without data about the resources itself. The 2 windmill pilot project is a place holder for the the offshore leases Dominion won in 2013, leases that include time frames for development. In 2016 DOE rescinded the $40 million grant for those pilot windmills and gave the grant to Cleveland where a project to understand the winter ice issue on Lake Erie was done. Cleveland is getting ready to build 6 windmill 20MW farm on the Lake. So the question the state needs to ask is … would Virginia be better served by having Dominion purchase wind output from farms constructed on Virginia’s lease area instead of being the developer and owner of our offshore wind? The states to our North are doing just that. Europe started with small projects like that, but now major global oil and gas companies and supply chain companies are moving into offshore wind. These companies are used to major investment projects. 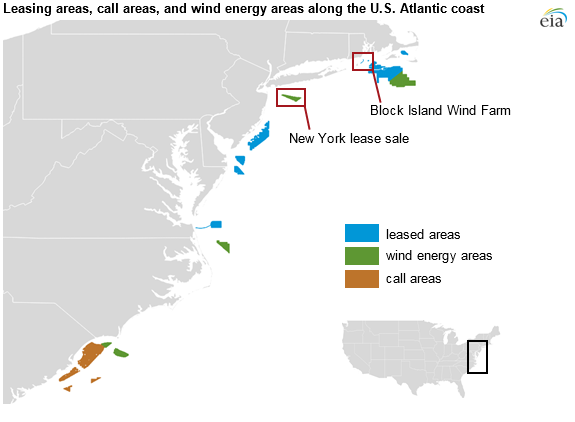 AWEA says in Massachusetts utilities banned together to select 800 MW from Avangrid Renewables and Copenhagen Infrastructure Partners’ Vineyard Wind project as the winner of their first major offshore wind solicitation and to purchase the energy and RECs from Vineyard Wind at a total levelized price of 6.5 cents per kilowatt hour. The utilities signed a Power Purchase Agreement with Vineyard Wind. They are not trying to be the owner/developer of the project and MA invested in port infrastructure required by the developers. Long Island Power Authority approved a 20-year power purchase agreement with Deepwater Wind for the 90 MW South Fork Wind Farm. The state will also invest $15 million to train workers for offshore wind jobs and develop port infrastructure. In Maryland it is the Public Service Commission who completed the first large-scale solicitation of offshore wind in the U.S. awarding ORECs to U.S. Wind and Deepwater Wind for two projects totaling 368 MW off the coast of Maryland that will come online between 2020 and 2022. Europe started small but the market is changing rapidly and the knowledge of the wind and blade installation has progressed. Is Dominion planning to join an undersea cable if it is built? Does Dominion have the knowledge to build and own the larger project? According to AWEA in August 2018, Dominion Energy filed with Virginia for approval to build the 12 MW Coastal Virginia Offshore Wind Project. In the same month, Ørsted signed the first U.S. offshore turbine order with Siemens Gamesa to supply two 6-MW turbines for the project. Sounds like Dominion is going to maintain the old utility structure … if they can. PS GE’s new turbines are twice the size of the ones Dominion has signed for … other manufacturers are 8MWs., not 6, and so we will get less production. Dominion controls everything in Virginia and especially, it protects and expands its bottom line. When we moved back from a deregulated marketplace in 07 we accepted a Dominion designed legal framework that has only been adjusted to further meet Dominon’s desires since then. The law that went into effect recently gave Dominion several things they didn’t get initially. Yes, it’s time for Virginia to realize that Dominion is trying to tie us down with a model that will not survive the next generation. As it clings to control Dominion is not evolving but hanging on to the past. Our leadership is unwilling to recognize this and thus is failing both the corporation that would be better served by evolving to fit future models and the state. Dominion controls everything in Virginia and especially, it protects and expands its bottom line. When we moved back from a deregulated marketplace in 07 we accepted a Dominion designed legal framework that has only been adjusted to further meet Dominion’s desires since then. The law that went into effect recently gave Dominion several things they didn’t get initially.